We use high performance vinyl for all our registration numbers. 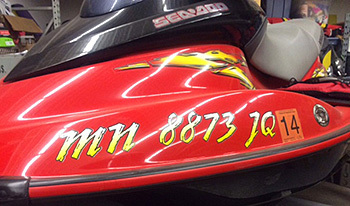 These are available in a wide variety of colors but our most popular for jet skis lettering are the metallic colors. Most cars, boats, and trucks have the metallic silver on them somewhere so when in doubt you could use metallic silver with a black outline drop shadow and gradients which is our most popular. Customize yours by naming it to match or pick another font and color to your liking! We can do anything you like and will send you a proof to approve before we print and ship out so you know exactly what you are getting. You can get creative with designing your own or let me design for you. Just email me your numbers/letters with your thoughts and I can take it from there!